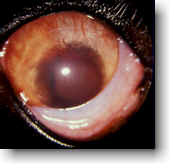 "Canine uveitis is caused by inflammation in the uvea, the part of the eye that supplies blood. It can cause cataracts and glaucoma if left untreated. Treatment includes topical medications for pain and inflammation." Uveitis is a condition where the part of the uvea, the part of the eye that supplies blood to the retina, becomes inflamed. The inflammation causes proteins to leak out resulting in cloudiness in the eye. Anterior uveitis and posterior uveitis refer to inflammation in different parts of the uvea. Canine uveitis can cause cataracts, scar tissue formation, retinal disease and glaucoma. Your veterinarian can diagnose the condition using a ophthalmoscope, an instrument used to inspect the interior of the eye. Treatment for uveitis attempts to reduce the inflammation causing the condition in order to avoid the onset of glaucoma. It also involves treatment of any complications. Options include topical medication for inflammation and medication to reduce any pain. Antibiotics are also sometimes prescribed, as in the case of infection to prevent the onset of glaucoma.